Netmail Scanit is a free reporting tool which generates a detailed audit of your Exchange databases. 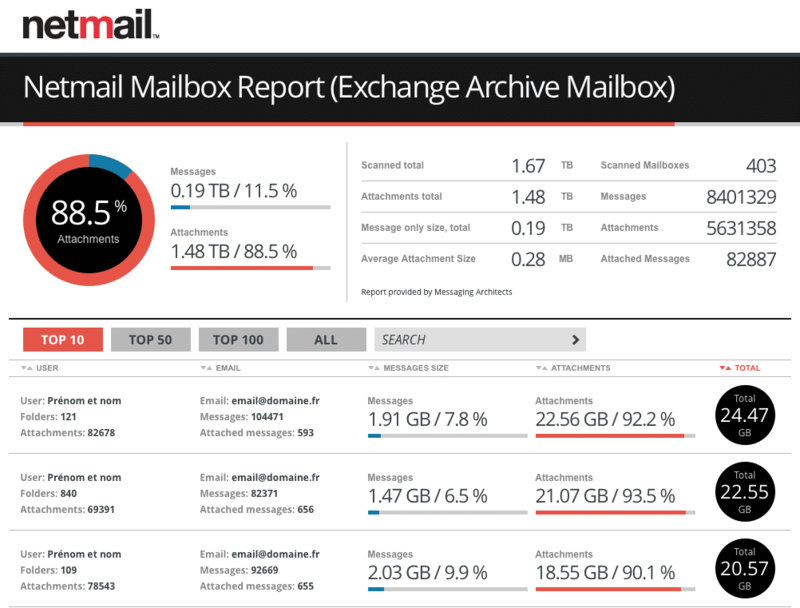 Thanks to this report you can easily analyse the impact and the proportion of attachments in your Exchange storage. Indeed, since the release of Exchange 2010, more of 75% of Exchange databases is about attachments because of the lack of Single Instance Storage. Moreover Netmail Scanit will enable you to identify who are the users generating the most of your volumetry. Both Netmail Archive and Netmail Detach can reduce this phenomenon by identifying and storing attachments individually outside of Exchange (In the case of Netmail Archive, it includes the email itself). To download Scanit, contact us, we will send you the download link through email.